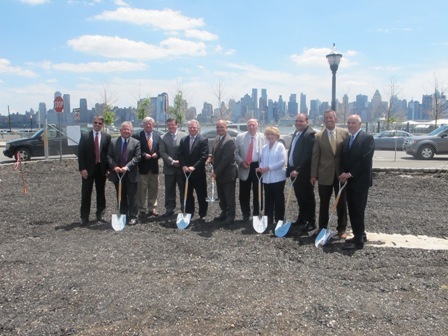 Ground is broken on a new 850-space parking garage near the Port Imperial ferry in Weehawken, NJ. From left to right: Parry Gosling, Wells Fargo; Carl Goldberg, Partner at Roseland Property Company; Tom DeGise, Hudson County Executive; Tim Lizura, Vice President of the New Jersey Economic Development Authority; Richard Turner, Mayor of Weehawken; Robert Sosa, Weehawken Deputy Mayor/Councilman; Arthur Imperatore, Sr., NY Waterway; Rosemary Lavagnino, Weehawken Councilwoman; Jose Munoz, Hudson County Freeholder; John L. Shinneck, Hundson County Improvement Authority Chairman; and Norman M. Guerra, Hudson County Improvement Authority CEO. Calling the project a key to unlocking the development potential of the Port Imperial waterfront, Weehawken, NJ Mayor Richard F. Turner led a group of officials from Hudson County, the state Economic Development Authority (NJEDA), New York Waterway and Roseland Property Company in breaking ground on a new waterfront parking garage on Wednesday, June 29. The groundbreaking marks the commencement of construction of an 850-space public parking garage at Port Imperial for ferry commuters to New York City and customers of local retail establishments. Once completed, the lot will free up a large tract of land that is currently utilized as a surface parking lot, making it available for future development. Luxury residential buildings, retail stores and a waterfront hotel are all planned for the site. The parking garage will also include 17,000 square feet of first-floor retail space and will help complete Port Imperial’s “significant intermodal connection,” which encompasses the ferry terminal and a Light Rail station, said Carl Goldberg, Partner of Roseland Property Company, the Master Developer of Port Imperial. Construction of the parking garage will be funded in part through financing from Wells Fargo, a $12.5 million loan from Hudson County, and a $9 million grant from the New Jersey Economic Development Authority through its Economic Redevelopment and Growth Grant (ERGG). The garage will take approximately 12-14 months to complete. Hudson County Executive Thomas A. DeGise said the county provided a loan for the project because the development work will stimulate economic activity and benefit Hudson County citizens, as well as create jobs in the long run. The county is also involved in the development of the Passaic River waterfront in Harrison for similar reasons. He added that the new development might entice New York City residents to take the ferry over and spend some money in New Jersey, a situation that is often reversed. Spanning two miles and nearly 200 acres along the Hudson River waterfront facing mid-town Manhattan, Port Imperial is one of the nation’s largest urban master-planned developments. 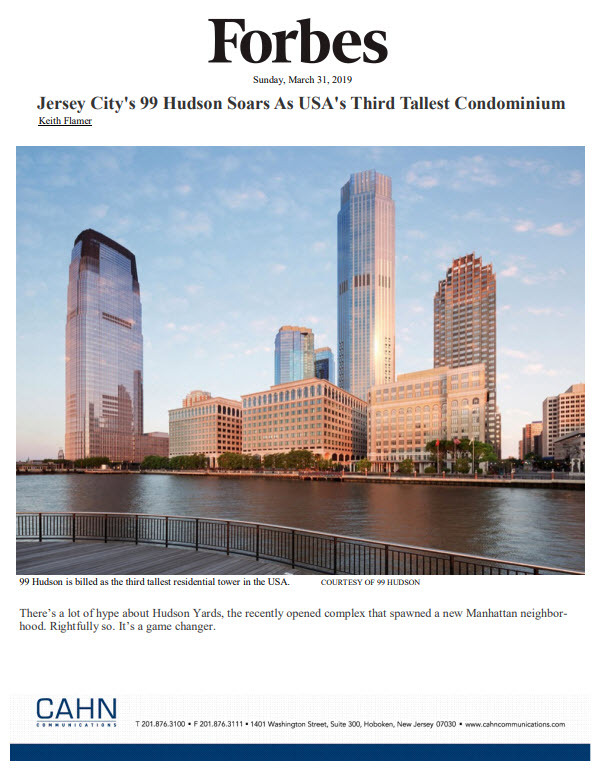 The $2 billion-plus development includes waterfront sections of Weehawken, West New York and Guttenburg and encompasses every aspect of a planned urban community. In addition to the approximately 6,000 townhomes, condominiums and upscale rental housing units, the riverfront community also features a mass transportation system anchored by an intermodal ferry terminal and light rail. Future office space and a luxury hotel with conference facility are planned. For more information on Port Imperial, visit Roseland Property Company’s website: http://www.roselandproperty.com. Since 1992, Roseland Property Company and its principals have grown to become recognized as industry leaders, having developed over 40,000 high-end residential units.